Currently the 6th highest trafficked online poker room, PartyPoker stated ‘listening to the players is central to our ongoing strategy‘. In a TwoPlusTwo forum post user ‘Party_Rep’ explained the decision to remove the processing fees was in response to feedback highlighting withdrawal fees as a contentious issue. 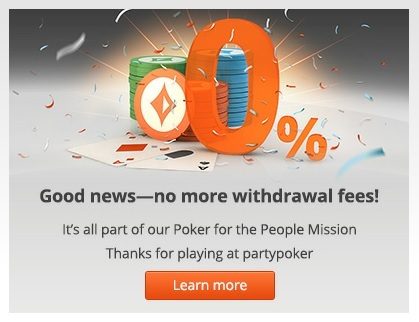 PartyPoker implemented a 3% withdrawal fee for eWallets such as Skrill, Neteller and WebMoney in 2013.
eWallets are less commonly used by casual players, so at the time that move was seen as part of the general move towards a recreational player model. At the current time this fee is still in place but Partygaming is said to be in negotiations to have the fee lowered. Other RoW facing rooms such as PokerStars and Full Tilt do not charge for eWallet cashouts. PartyPoker introduced the 3% fee around the time many players were abusing a 1.5% cashback promotion run by Skrill. PokerStars and other sites detected this and stopped running the promotion, but didn’t raise fees. PokerStars also allows players to request higher deposit and withdrawal limits. PartyPoker has had an interesting history of changes and updates, in its transition towards favoring a recreational player model. Sep 6, 2013 – PartyPoker launched its new software, with player achievements and missions. March 1, 2015 – PartyPoker lowered the points requirements for reaching each VIP level and reintroduced instant cash options, at up to 22.2% rakeback. Bonuses were then removed.